Our new pal Marcelle (in the bright blue t-shirt) wacthes from the skybox seats. On April first we joined in the fierce competition of the Strawberry Monkey Yacht Club’s final bocce ball tourney of the season. Team Blue Wing lost our first match to bocce queen Rose and her partner Mike. We were victorious in our second match, but were eliminated in our third by the overall victors, who earned the right to sign the golden coconut. This prized trophy will be on display at Snappa’s until next season. 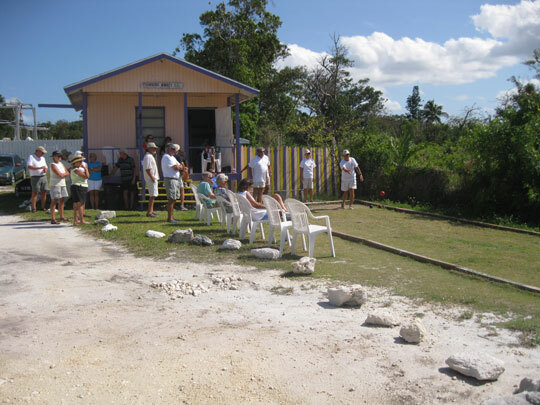 The bocce arena was built several years ago by SMYC volunteers. Veteran SMYC members, who have intimate knowledge of the court’s challenging terrain, have a decided advantage over newcomers. During play there is enthusiastic crowd participation from the (hot) bleachers and the (cooler) skybox seats, especially when players fail to toss the white ball far enough, and have to take the ‘Walk of Shame’ to retrieve it. 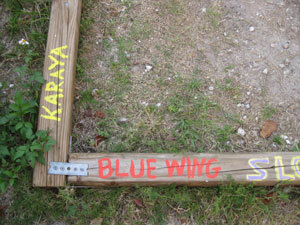 Team Blue Wing is an offical SMYC member. To become a member of the SMYC you must paint your boat’s name on the edge of the court, try to throw as close to the white ball as possible, and go across the street to happy hour at Snappa’s after the match. 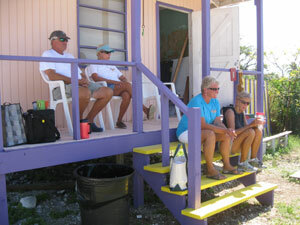 At the match we met Pat and Marcelle from the sloop Island. (Island comes from the Icelandic spelling of Iceland.) On Monday they invited us over to Island for afternoon refreshments. We had so much fun we almost had to go back to Blue Wing in the dark. 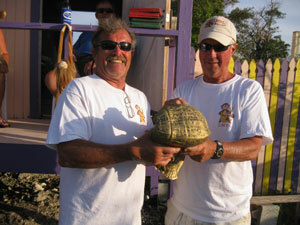 The victors sign the prized golden coconut. Note the conch shell base. Looks like your kind of thing! Glad you are meeting a lot of people. Bocce Ball….being of Italian heritage, I could of helped alot….played many games in my native Bronx growing up….glad to see you guys enjoying your adventure….the pictures are great…..stay well…. Oh yea. The festivities have begun! The wirie is okay after all? I can’t WAIT to visit. Dan needs to accumulate some vacation time first. Then again, I could come without him.